NAVIGATION: Home » Frequently Asked Questions (FAQ) » What is the Background and History of Initiatives? What is the Background and History of Initiatives? The background history of initiatives and direct democracy voting for initiatives and referendums by the citizens on important issues started around two thousand five hundred years ago In Athens, the cradle of democracy. About 590 B.C. power was granted to all the propertied classes, thus establishing a limited democracy. About 500 B.C., democracy was extended to the freemen of Athens (women and slaves who made up more than half of the population, and others were excluded). 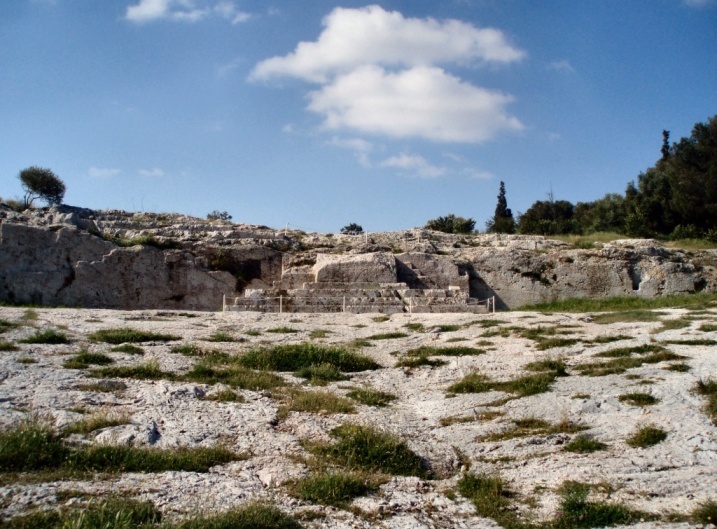 At that time, the city of Athens’ population was approximately 100,000 (Polopolus) with possibly 250,000 including surrounding areas. Of these, about 100,000 were citizens and about 30,000 were males entitled to vote. The voters were called the Ecclesia or Ekklesia—i.e., the Electorate. A quorum of the Ecclesia consisted of 6,000 citizens. The Council of Five Hundred (or Boule) was introduced, with important preliminary jurisdiction to deputize when the regular meeting of all the Voters was not in session and to select the agenda (i.e., select Candidate Direct Initiatives) for the Ecclesia (i.e., the Voters). The Ecclesia met near the Agora on the Pnyx hill, which could seat about 6,000 on its slopes. 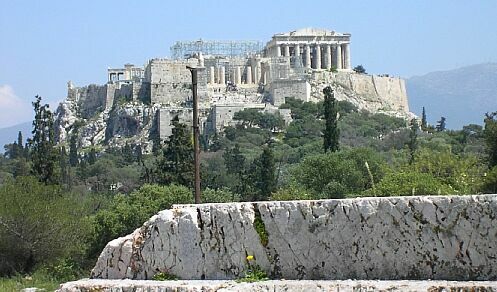 It is shown below with the Parthenon on the Acropolis in the background (photo courtesy of Adam Carr via Wikipedia under GNU License). The selection of Council of Five Hundred members was usually by lot and for only one year to prevent the monopoly of the office of deputy by professional politicians. The Athenians had citizen initiators (Ho boulomenos—he who wishes). These were citizens who exerted their right to propose an issue, which they called a probouleumata, for consideration by the Boule and potential consideration by the Ecclesia. The Athenian probouleumata effectively corresponds with our initiative. Citizen initiators could be called to account for their actions, so abuse of their right had constraints. By about 460 B.C., the transfer of power to the People who made all important decisions, the Council of the Five Hundred, and the jury courts had been completed. The city retained a substantial degree of direct democracy for 180 years—surviving even its final defeat by Sparta in the Peloponnesian Wars—until its conquest by Macedonia (Carey). Athenian contribution to culture and politics around the world has been profound—arguably more important than that of any other society in the world’s history. However, the Founding Fathers wrote the Constitution in 1787, a hundred years before the discovery of Aristotle’s “Constitution of Athens”, which had been lost in the 7th Century and not rediscovered until 1880-1891. Texts possessed by the Fathers quoted Greeks who were critical of democracy—especially Socrates who advocated a republic led by philosophers. Madison was particularly critical, writing in Federalist Papers No. 55 “In all very numerous assemblies, of whatever character composed, passion never fails to wrest the sceptre from reason. Had every Athenian citizen been a Socrates, every Athenian assembly would still have been a mob.” Despite 140 years of direct democracy in New England town meetings starting as early as the 1640’s, there was no evidence in 1787 that these small democracies could be scaled up for nationwide benefit. To the Founding Fathers, it seemed necessary that in a democracy all voters should assemble at a single location. The methodology of a statistical random sample of the People for polling or to select and qualify candidate initiatives developed over the period 1850-1930. The Founding Fathers seemed unaware that the ancient Athenians considered their city too large to assemble in one place. Their key democratic assembly—The Council of Five Hundred—and juries were chosen by random selection of citizens. The Council of Five Hundred managed everyday affairs and set the agenda for much larger meetings of the citizens. It seems extraordinary that the Athenians intuitively chose the right statistical minimum number of 500 for a good random sample! The earliest use of a referendum in modern democracies was in 1793 in France when a new constitution was submitted for popular vote. France, however, seldom used referendums until around the mid-1900s. Some Swiss Cantons adopted referendums between 1831 and 1890 for both legislative measures and constitutional proposals (Magleby p.31). Switzerland’s constitution was drafted in 1848 (loosely modeled after the U.S. Constitution, but incorporating direct democracy as well as federalism) and was revised in 1874 and again in 1999. Since 1891(Fossedal p 90), Switzerland included the right of initiative for changes to the federal constitution. Switzerland is a relatively small country with a population today of 7,300,000, which speak four native languages though many are multi-lingual. It is divided into 26 relatively autonomous Cantons with an average population of 280,000, though this varies widely among Cantons. Only 100,000 signatures (about two percent of the voters) are required to petition a popular vote on new federal legislation. Switzerland has four elections per year and is by far the greatest user of initiatives and referendums that the world has ever known. In fact, Switzerland is the only modern democracy that currently permits citizens to propose laws in the form of [direct] initiatives(Long) (though The Netherlands introduced national indirect initiatives—“consultative corrective referendum” nor “non-binding rejection referendum”—in 2006). The key to the Swiss approach is to make decisions at the lowest appropriate level—sometimes called subsidiarity or devolution. It is unlikely to be a coincidence that over the last one-hundred years, despite being in the middle of wars collectively resulting in over 70 million deaths from all causes, Switzerland has been amongst the most peaceful countries in the world, has amongst the highest per-capita income, is universally trusted (even if some believe Swiss financial privacy laws excessive), and has a quality of life consistently among the top ten countries in the world. Some current trends are lower voter turnout and excessive numbers of initiatives by special interests that may result in future adjustments to the system. Many other more recent democracies have used binding national referendums during the last fifty years, some extensively and to great benefit. They include: Austria, Denmark, France, Germany, Greece, Iceland, Ireland, Italy, Norway, Portugal, Spain, Sweden, Switzerland, South Africa, and most recently in 2005 The Netherlands. (Belgium, Britain, and Finland use primarily consultative or advisory referendums). In the past 200 years, there have been a little over 800 referendums held at national level; over 400 of them in Switzerland (Butler & Ranney). Following The Netherlands’ 2005 consultative referendum rejecting the EU Charter, there remain only four major established democracies that have never held a national referendum: India, Israel, Japan, and the United States. January 1933: President Hindenburg appointed Hitler as Chancellor. March 1933: The Reichstag passed the Enabling Law granting Adolf Hitler dictatorial power. August 2, 1934: Hindenburg died. August 19, 1934: A plebiscite (i.e., referendum) of the German people ratified Hitler’s dictatorship as Der Führer and Chancellor. In 1991, the Soviet Union under the leadership of Gorbachev and Yeltsin, used several state-sponsored national referendums that must be blamed in part for the chaos of the following ten years. State-sponsored national referendums tend to be conducted with highly-charged emotion, state propaganda, and military coercion. Direct Democracy started well before the U.S. Constitution in New England town meetings and school district meetings involving lawmaking by assembled voters. However, this does not involve use of initiatives. A Brief History of Initiatives and Referendums in the U.S. There has never been a nationwide Initiative or Referendum in the U.S. The absence of a U.S. Initiative is a possible consequence of the early date (1787) of our Constitution. Subsequent constitutions in other countries, including the Swiss, were modeled on the U.S. Constitution and often include them. Major U.S. support for Initiatives and Referendums came in the late 19th Century with the Populist and Progressive movements, and were adopted by the first State (South Dakota) in 1898. Modern U.S. systems of initiative and referendum originated in the state of Oregon in 1902. The “Oregon System“, as it was at first known, was widely adopted by the other states. In 1911, the State of Wisconsin submitted applications for a Federal constitutional convention, a constitutional amendment to permit Federal constitutional amendments by initiative, and a constitutional amendment to permit Federal initiative, referendum, and recall. However, nothing came of this effort. The new Progressive party was formed in 1911 through 1912 by President (1901-1909) Theodore Roosevelt. Its platform called for the direct election of U.S. Senators, the initiative, referendum, and recall, woman suffrage, reduction of the tariff, and many social reforms. It failed to elect a President in 1912, and was disbanded in 1916. A war referendum plan was popular within the United States from 1914 and especially in the 1920s and 1930s, and later in the 1970s. Representative Louis Ludlow (D – Indianapolis, Indiana) introduced the Ludlow Amendment several times from 1935 to 1941; despite strong support in national opinion polls it was returned to committee. The issued reappeared again during the Vietnam war and a proposed constitutional amendment was introduced in the House on April 1, 1971, using the exact text of the earlier Ludlow Amendment. Again, it failed to pass. They proposed the State petition rather than the Citizens’ Initiatives Assembly method of qualifying Initiatives. They supposed that Congress would take action without considerable voter pressure. Their approach dealt in generalities rather than forcing the issue by a detailed plan that could be discussed and analyzed, put to a vote, and implemented. The matter was dropped by Congress after the hearings. However, this attempt and its outcome are illuminating. There is also more recent evidence that the U.S. citizens want their right to vote on United States Initiatives. The Washington Post (Merida) reported a 1994 poll showing 64 percent of those interviewed favored a national referendum. The record of the 103rd Congress in 1994 shows considerable interest in the subject, especially in regard to term limits, balanced budget, and line item veto issues. These issues had been supported by many respected public policy organizations such as Citizens Against Government Waste, Heritage Foundation, National Tax Limitation Committee, United We Stand America, etc. However, Congress as a whole was disinclined to pursue these matters at that time. There are many recent and current members of Congress who have expressed strong support for various forms of nationwide Initiatives and Referendum. The efforts by Senator Mike Gravel (Alaska 1969-1981) are in progress. He founded Philadelphia II and Direct Democracy, the nonprofit entities leading the effort. A Democracy Amendment is currently proposed for electronic voting using People’s rights inferred from Article VII of the Constitution. The scope of the Democracy Amendment is more far-reaching than this Solution but is administered by an organization of elected representatives. See I&R Factsheet for more details. In the U.S., all the States submit legislatively-derived State constitutional amendment referendums to a vote of the people except for Delaware, which has used legislative but not constitutional referendums. 24 States have an initiative process whereby if citizens can collect sufficient signatures they may place a question or referendum for popular vote. In many cases this covers constitutional rather than law issues, and in others the initiative is indirect because it must go to the legislature before it is put to the people. However, in 14 States, direct initiative statutes permit laws proposed by signature petition of the people to be directly placed on the ballot as a referendum for voter approval or rejection (I&R Institute). The number of signatures needed to qualify the petition averages about eight percent of the votes cast for governor in the preceding election, but varies widely up to 15 percent of the gubernatorial vote and down to two percent of the voting-age population. In California, with a population of about 35 million people, the number of signature required for a direct initiative on a law is about 420,000; for a State, constitutional amendment about 670,000; and 890,000 signatures were required for Governor Davis’ recall. Signature gatherers were paid .75 to 1.00 dollars per signature, and the cost of the signature drive pro and con was estimated at four million dollars. As the recall gathered momentum, the GOP supporters privately funded an aggressive media promotion, the cost of which is probably unknowable. For reference, $90 million was spent on the gubernatorial race in 2002; the candidates spent about $90 million; the special recall election cost to the State was about $30 million. When the final numbers become available, the expenditures will probably turn out to have been larger. For the 2004 elections, about $400 million was spent on 59 state initiatives in 18 states and on average is cost about $12 million to qualify and advance an initiative and $6 million to oppose it. The most frequent use of initiatives and referendums has been in ancient Athens (city population 100,000) and modern Switzerland (population 7,300,000), both small democracies by today’s standards. In both cases, they were largely drafted by the participants. In both cases the countries achieved extreme prosperity despite modest natural resources and, considering the extraordinary chaos going on around them, relative peace. A referendum initiated solely by a Government in a highly-charged emotional crisis can be dangerous, and is subject to manipulation and propaganda by the Government. It is desirable to have a deliberative process to review any rash decisions. In most countries and many States, Government is closely involved with drafting the referendums, and exerts much influence on the results. The U.S. Congress has not allowed even Government-initiated referendums. Direct initiatives in all cases except Athens involve obtaining a large number of signatures, investing much time and effort, and financing substantial expenditures before an initiative can be put on the ballot.